Welcome to the stunning home of Peter Cohen – named “Nekko” which is the word for cat in Japanese, inside you will find a cats paradise! Photo courtesy of Santa Barbara Home Builders Trillium Enterprises, INC.
First of all, the man in question is Peter Cohen, co-founder of the general contracting company, Trillium Enterprises of Santa Barbara, CA. 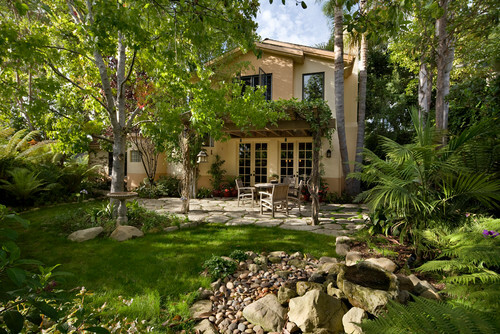 Trillium Enterprises was founded in 1989 after Peter and his brother, Ken, graduated from UC Santa Barbara and spent time working as Supervisors and Foremen for a local General Contractor. Loving the field, they decided to branch out on their own and Trillium Enterprises was born. Perusing the Trillium website, you will see a stunning gallery of aesthetically redesigned and renovated homes, commercial buildings, and outdoor gardens and decks. All of the pictures will take your breath away with their simple beauty – every nook and cranny in each individual project has been artfully crafted to create a perfectly balanced environment that makes it seem effortless and timeless. 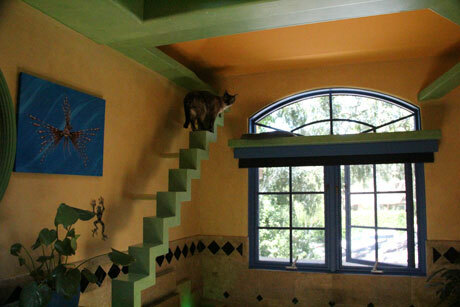 With that said, it is no surprise that Peter’s remodel of his 4-bedroom, 2.5 bath home in Goleta, California that he shares with his partner, Manuel, and roommate, Hiro, is such a perfectly blended architectural structure and tribute to his 18 cats, collectively allowing humans and felines to share space in high-style and functionality. 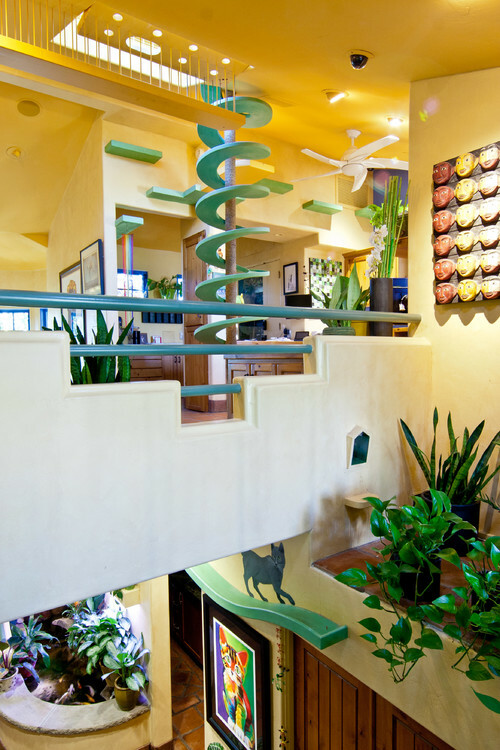 At first glance entering Peter’s home you would never know what architectural treats were in store for his beloved felines! Photo courtesy of Santa Barbara Home Builders Trillium Enterprises, INC. Thank you for a few minutes of your time Peter. 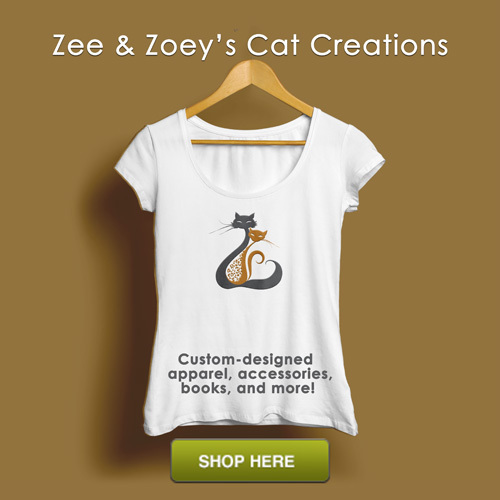 I know you have made the rounds lately on numerous blogs, websites, and publications with your story and I appreciate you adding the Zee and Zoey blog to your list! 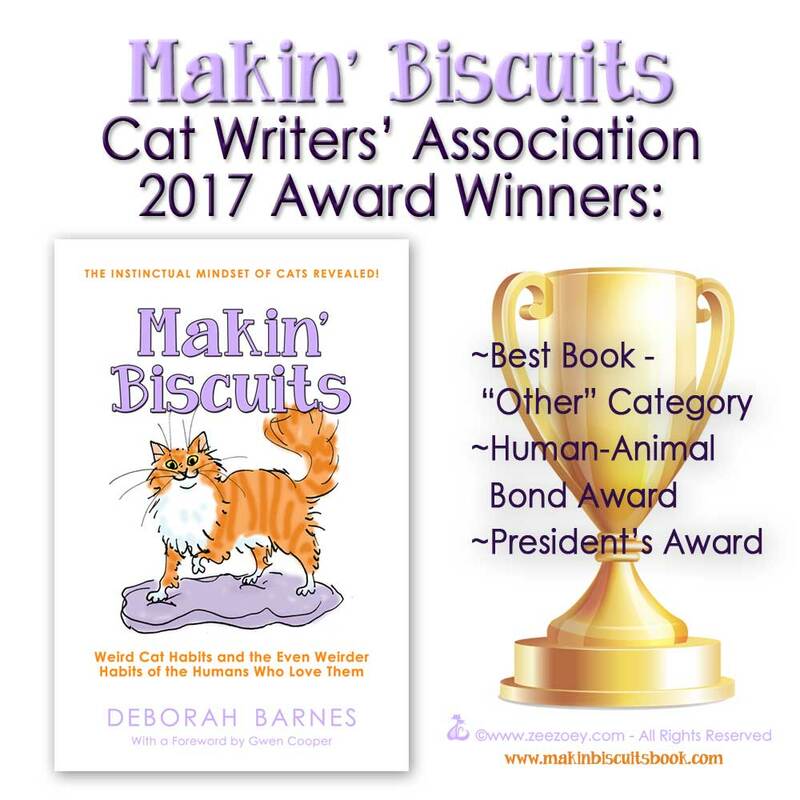 So to begin, clearly there is no doubt you have created a paradise for your cats, but what my readers really want to know, is how is it that you came to have 18 cats? Can you tell us a bit about your feline family – as in, have you always been a cat lover, where did they all come from, and what are their names? Actually I grew up with dogs as my entire family is allergic to cats. My cat allergy just went away over time. When I bought this house in 1988 it came with 2 stray outdoor cats. After one was killed by a car and the other was injured by a different car, we made the surviving cat an indoor cat and went to adopt a companion for her. I NEVER intended to have 18 cats but there were so many who needed homes and we just started adopting 1 or 2 every year or so. Their names are Nekko, Seven of Nine, Wasabi, Kuro, Poppyseed, Coconut, Coffee Bean, Donut, Crumple, Rumple, Butter, Nutter, Secret, Cookie, Waffle, Nui Gurumi, Cheesecake, and Chocolate. Mojo, The Grey One, Munch, Bobby, Avocado, and Gizmo are no longer on this planet but were part of our family for many years. I know that you have lived in Japan for several years and I have seen a lot of stories recently about cat lovers in Japan creating super structures for their cats in their homes. Is that how you got the idea to remodel your home for your cats or was there a particular cat in your life or reason that inspired your remodel? I actually was inspired by a small book by Bob Walker, The Cat’s House, that I happen to see in 1995. Being a builder I thought “I can do that “ and started building catwalks. 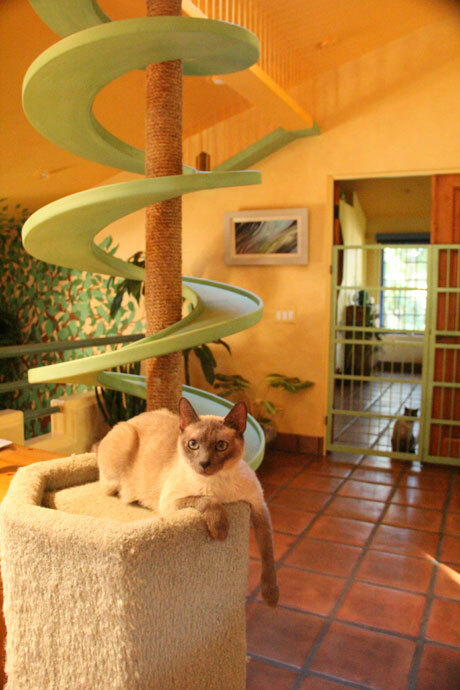 You quickly realize it is all about the cats when you see the incredible spiral staircase and sisal scratching pole that was made for them. 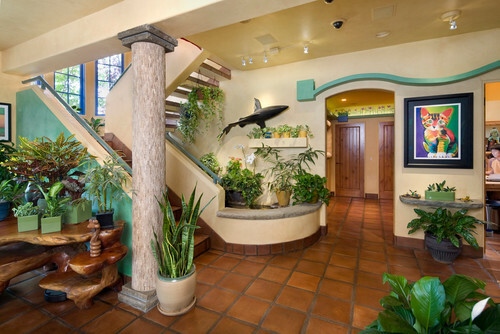 Photo courtesy of Santa Barbara Home Builders Trillium Enterprises, INC.
A close-up of the staircase with Coconut (11 years old) sitting in Peter’s office and Donut in master bedroom behind the green gate. She actually can jump the gate whenever she wants to but it keeps some of the other cats in Hiro’s room. 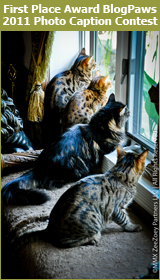 Cats are curious by nature – how was it remodeling the house with them around and how long did the remodel take from start to finish? When we bought this house in 1988 it was a single story 1600 square foot house. We did a major remodel in 1991-93 and started building catwalks in 1995. During the large remodel we had 6 cats and it was a bit stressful for humans and cats alike. The catwalks have been built over the past 18 years and are never really finished. The cats know the finish carpenters and often are standing on a new walk even while it is being built. Certainly they come out at night and explore the new walks! 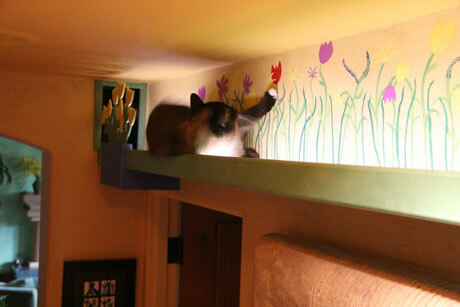 Custom shelving installed above the doorways to lead cats from one room to the next. Photo courtesy of Santa Barbara Home Builders Trillium Enterprises, INC.
Seen here is Coffee Bean in a close-up. 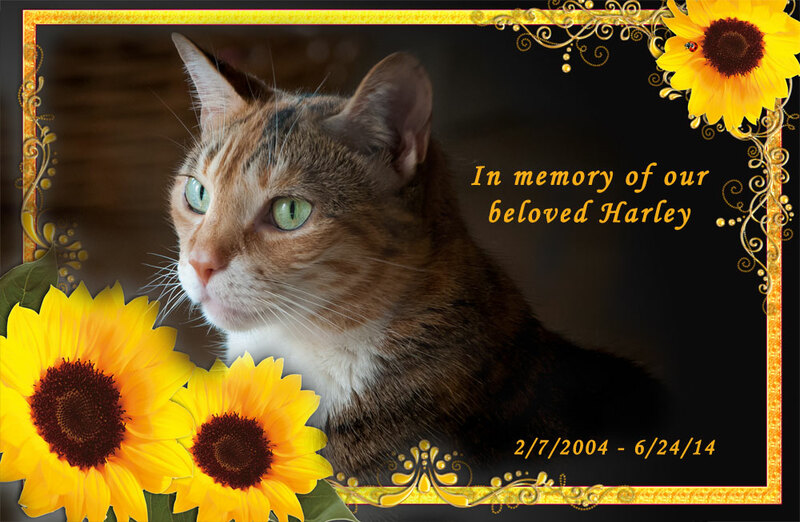 She was adopted as a kitten in 2006 from a shelter in San Diego and had been rejected by two families because her tail is kinked. She roams the entire house and while she used to be a bully she has mellowed with years. Photo courtesy of Peter Cohen. Cats have so many instinctive behaviors – the need to hunt and play, the desire to find high and low places to hide and nap, and the need to scratch their claws. 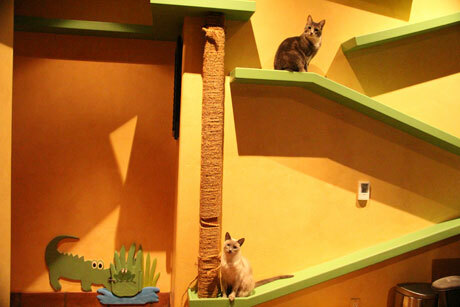 Did you do research on cat behavior before the remodel to help design the ideal feline playground, or was the design exclusively inspired from the lessons learned from your own cats? The walks have evolved based on experience gained seeing how they use them. For example, some of the first walks led to cats fighting or getting “trapped” and peeing. Thus, we learned that we always need to try to give them at least 2 ways to go so they do not feel cornered. Dead end walks are NOT a good idea! This also helps with cats that like to “block” tunnels or entrances to litter box areas. I also have been forced to add litter box closets when the cats decided they were going to pee in a room that did not have boxes in it. So we adapt to them and they to us. It is definitely a two-way street! 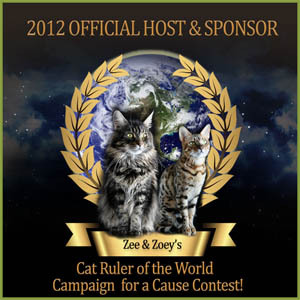 No matter where you live, litter box issues always need to be addressed! Photo courtesy of Peter Cohen. You have so much going on – the spiral staircase and sisal scratching pole leading to upper deck shelves, a superhighway in several of the rooms that allows the cats to roam and jump from shelf to shelf, and charming little cubbies to hide in like the Jaws shark head in your master bathroom – everything is just so creative. 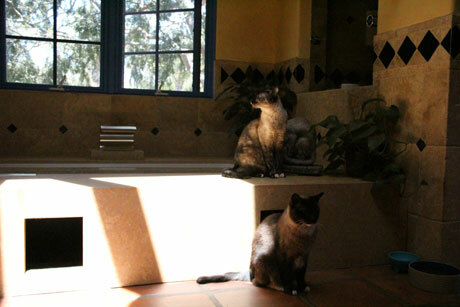 Do you have a favorite area, or should I say, do the cats have a favorite part of this oasis? When I first started building catwalks I was worried the cats would not use them. NEVER a problem!. Since I build the walks for the cats AND for me (I like the aesthetics), I would say I like all of them since I helped design them. I would say the shelves that let the cats lay under skylights or looking out windows are the most favorite for them. But they also love to chase each other up on over the walks at great speed. Peter’s gorgeous master bathroom. 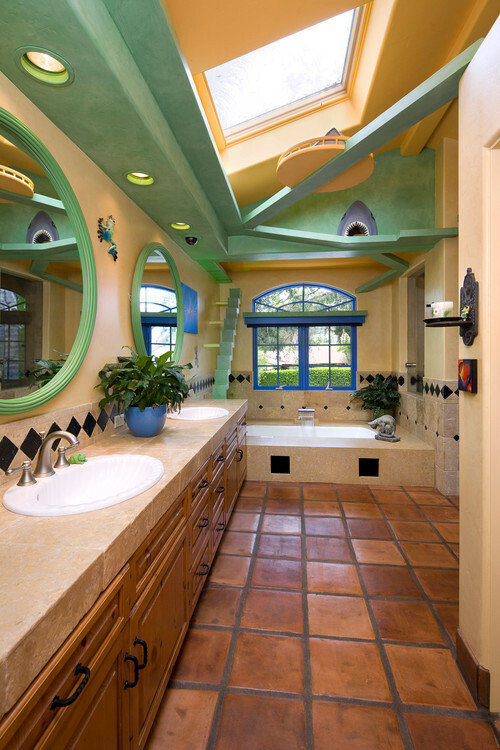 Photo courtesy of Santa Barbara Home Builders Trillium Enterprises, INC.
Donut walks above the tub in master bathroom. Photo courtesy of Peter Cohen. Coffee Bean and Donut share some master bathroom space. Photo courtesy of Peter Cohen. 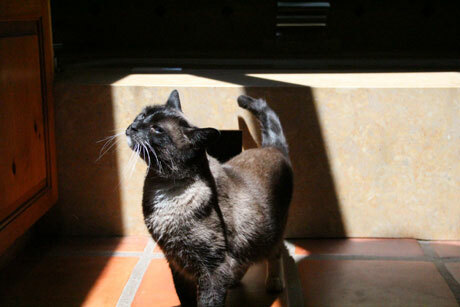 One of my favorite photos – Coffee Bean enjoying a sunbeam in the master bathroom. Photo courtesy of Peter Cohen. I have seven cats (edit… I have EIGHT cats) and sometimes they are so absorbed in napping that without seeing all the cat furniture around the house, you might not even know they were around they are so quiet. Other times, it can be a feat just walking from one room to the next without tripping over one of them – what is it like living with 18 cats? Do they tend to hang out together, or do they have their own separate areas that they prefer? In fact it is really hard to feel we have 18 cats. Due to age, illness, and personality conflicts, another lesson we learned was that we needed to separate some cats from others. 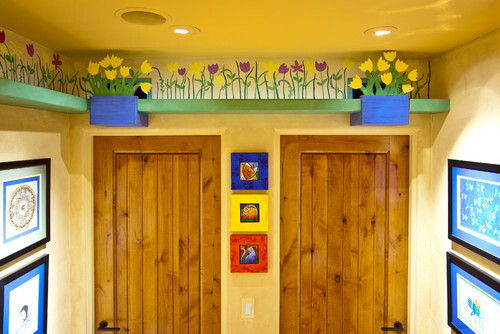 Thus, even though the walks and tunnels connect every room of the house, often in multiple ways, we have the ability to close off walks as needed. So, for example, Crumple is a 3-year-old cat that for whatever reason loves to terrorize some of the older cats. So we closed her off in one of the rooms with 2 other cats she gets along with. We open the walkways when we can keep an eye on her and hope she will mellow. In some cases, after keeping a particular cat in one room or area for a while, the cat just hangs out there on its own. Kuro, our only black cat, was afraid of the other cats for years and we kept moving her from area to area trying to find a place she was happy in. Finally she found a place in our kitchen by a window and that’s where she hangs out and feels safe. The other cats no longer bother her. She sometimes wanders to other areas but always returns to kitchen. Manuel’s office – far left cat is Crumple. She is about 3 ½” years old and for some reason only really gets along with the two other cats in this picture. For that reason she is usually kept in this room. The gray cat standing on top of the box is Rumple, same age as Crumple, and the white cat in front of her is Butter, who is 2+ years old. It’s hard to see here, but the small blue “house” above the door says “Bobby’s Catwash” and it honors Bobby, a male cat that suddenly became paralyzed when he was only about 5 years old. Over the years he learned to walk again but could never control where he went to the bathroom. We build a special large cage area in this room that allowed the other cats to visit him by the catwalks. 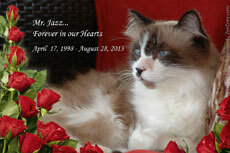 We finally had to put him to sleep a few years ago and he was a very loving cat. Photo courtesy of Peter Cohen. 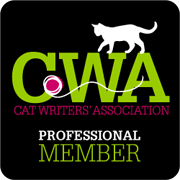 My cats are also very social and they like to spend time with me – either hanging out in my office, on the couch with me, or on the bed at night. 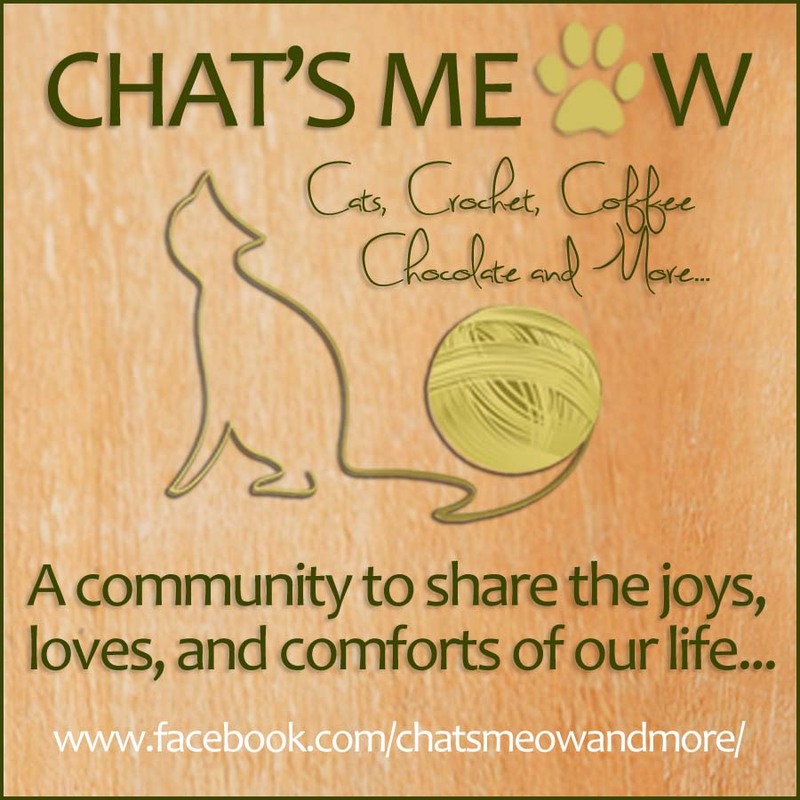 How do you find ways to give each cat that special one-on-one time that they want or need from you? This is one of the hardest parts to deal with. Manuel, Hiro and I try to spend time with all cats but some do not seek/need much human companionship and some actively seek us out. Crumple peering from Manuel’s office into the master bedroom. Photo courtesy of Peter Cohen. 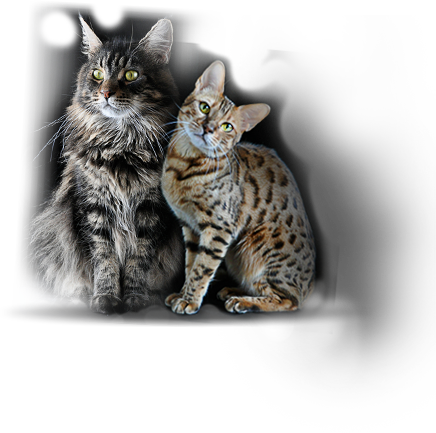 Since this article on the Laughing Squid has been published, have cat loving clients reached out to you to have a feline remodel done to their home? 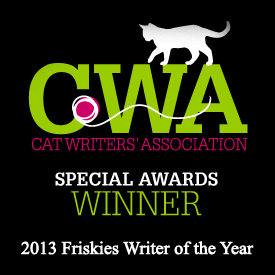 To be honest, I was shocked at the reaction to the first article (it was published on Catster). Since then, there have been articles written all over the world and I have just given an estimate for installing catwalks in a house about 1 hour from here. Many requests for design help as well have come into my office. Nekko, same name as Peter’s house, is his oldest living cat at the age of 17. Seen here she enjoys a creative set of stairs and shelves to climb and rest on and is still doing great. Photo courtesy of Peter Cohen. Clearly your home is a dream come true for cats and cat lovers, but not all of us can afford a remodel like the one you have done (it cost approximately $35,000). Do you have any low-cost advice or tips to offer on ways that we can make our homes more cat friendly on a budget? Yes. Almost everything I have built can be installed on a budget as well. The cat walks in my house are 1 ¼” solid wood bolted to the wall and then edged with wood to hide the bolts and give them a profile height of 2.5”. However, simple shelves with exposed cleats or shelf supports will do the same thing for way less money. 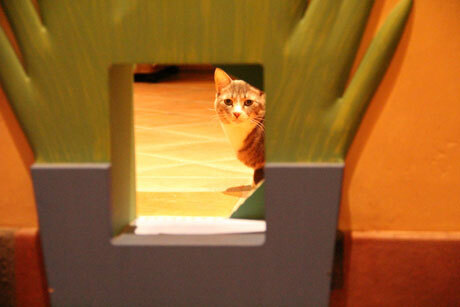 Tunnels can be made using PVC pipe and simple square picture frames, etc. I think the only thing that cannot be economically made is the spiral ramp or curved shelves. 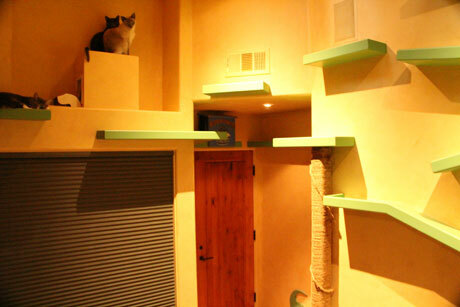 However, I have seen many cat walk systems that offer curved shelving that were not that expensive ($100 or so). The other thing to remember is I have been building these for years. It is like a hobby. When we have a new idea and money to do it, we add another part. Butter is on the bottom next to an adorable crocodile and frog door that is in Manuel’s office that leads to the master bedroom. Crumple is above. Photo courtesy of Peter Cohen. Okay, I could ask questions all day, but I will be polite and end it with this one – I know in my house, despite all the great cat condos and comfy pet beds, nothing beats an empty box to play and nap in… How about your cats? Since they live in paradise, do they turn their noses up at a plain old box, or is a cat is a cat is a cat when it comes to a box or the other simple pleasures of life? LOL cats are cats. They still climb into any empty (or not empty ) box they can find. 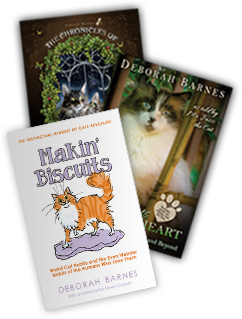 But as I mentioned above, we often take our cues from the cats themselves. We noticed they love to hang out in from of heater vents so now build those walks wider to allow that. When I saw one of my cats liked to watch TV, we built a place she could lay down and easily do that. Sometimes the cats will insist even when we try to refuse. I had cats insist on walking on the 1 ½” wide edge of the headboard on my bed. They would sometimes fall off and land on our heads in bed. After trying for months to stop this, we gave in and installed a wider walkway on top of the headboard! 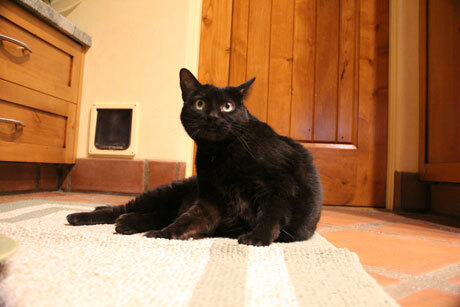 Kuro (black cat in Japanese) is Peter’s only black cat and she is 16 years old. Here she proves like any good cat would, that sometimes despite all our best intentions, sometimes lying on a simple rug on the floor is the best spot of all. Photo courtesy of Peter Cohen. Lucky kitties, lucky humans! This is a dream house for all of them and done so well. I love this story! 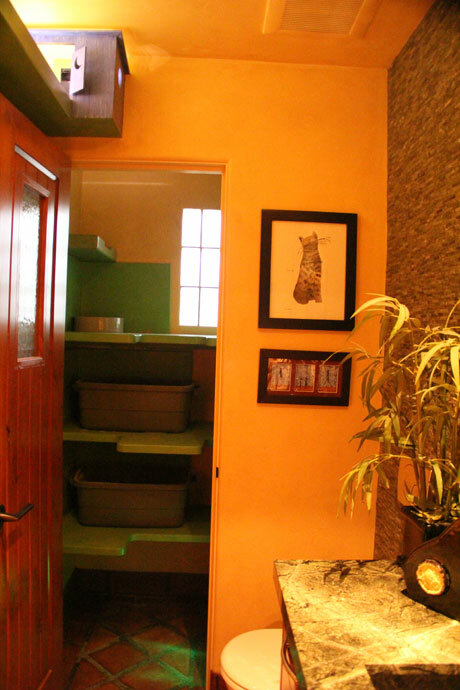 18 cats is a large number for one house, but this home is so well-equipped and loving that it is perfect for them. So nice to see kind, cat loving people with the desire to make a happy life for their pets! 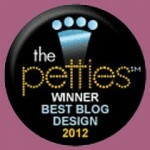 Great article, Deb! Thank you for showing us this house. we haz packed up N set sail…see ya trout towne we bee mewvin ta california !!! What an interesting article Deb! Every room is unbelievable but my favorite piece has to be that amazing spiral staircase, sisal scratching pole and the master bathroom. What a lucky bunch of kitties. LOVE, love, love!! Since we have a large number of kitties and also foster this house is pure inspiration. I can see how their designs would help with various issues that come up when you have multiple purrsonalities trying to all live in harmony. I hope to be able to incorporate some of these fantastic ideas though I’m afraid I am not the handiest woodworker. Thanks for the inspiration! That has got to be the most awesome house in the world! We intended to put cat walks around our walls, over windows, but installing the first one showed that our ceilings are way too short, even for tiny little Star. Poo. Wow, this is even more in depth than my interview with Peter! I think we’ll be seeing a lot more of Peter. 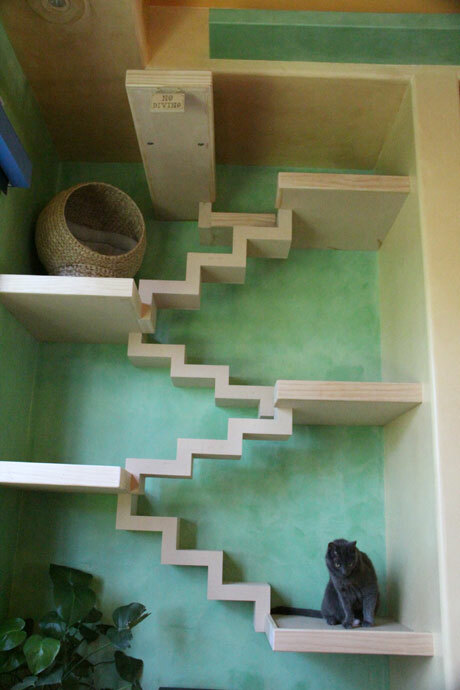 It’s great to hear more about Peter and how he has adapted his house for his cats. We think Layla is right… we suspect we’ll be hearing more from him around the cat community. I want to live there and adopt a thousand cats. What a cool house. Some lucky cats live there.